Our much-anticipated book, entitled ‘Authentic Recipes from Around the World’ (HAT Events, 2015), written by the investigators of the project (Emma-Jayne Abbots, Anna Charalambidou, Elaine Forde, Ana Martins, Hazel Thomas, Deborah Toner) and a number of collaborators and external partners has been published! Opening the first box of books! This general audience book is the outcome of the AHRC project “Consuming Authenticities: Time, Place and the Past in the Construction of Authentic Foods and Drinks.” It addresses the temporal relationships and ideas that contribute to the construction of narratives of authenticity in relation to four foods and drinks: pulque (an alcoholic drink from Central Mexico), flaounes (celebration Easter pies from Cyprus), Welsh craft cider and acarajé (a street snack from Brazil). 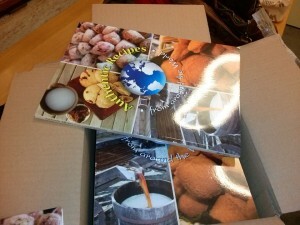 It also includes easy to follow recipes for/with our food and drink products. The book launch took place on the 23rd of October in the Woburn Suite at the Senate House, London, with the kind support of the Institute of Latin American Studies. In addition to the book presentation, the event included a storytelling session with collaborators from each case study, and dinner, including scrumptious flaounes and delicious Welsh craft cider. The book is distributed for free, as long as stock lasts, so if you would like to get hold of printed or electronic copy, do get in touch!